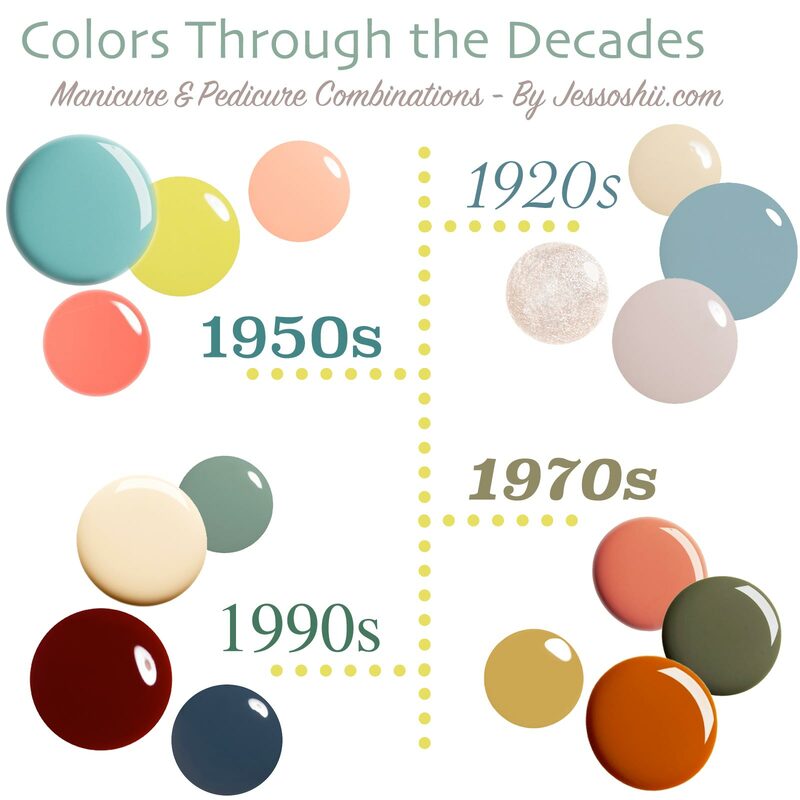 In this post, I’ve put together some decade-inspired nail polish combinations, featuring classic color palettes from the 1920, 1950s, 1970s, and 1990s. Each set of shades shown above can be customized to fit just about any lifestyle or event – from office appropriate looks to summer beach party combos. For example, want something office appropriate? Try a classic 50s look – use a light coral on the nails, with a fun bright lime on the toes (one that you can show off on the weekends while those closed-toed shoes stay in the closet). Want to go crazy? Go for a 70s vibe! – add a coat of olive green on the fingernails, then stipple on a row of dots with a yellow-green polish on top (check out these tools to help you make some cool designs, like dots, strips, and more). Then match with dark orange toenails! Whatever your style, you can mix and match however you choose. Use one, two or even all four shades! Here is the full description of the nail polish colors I’ve handpicked for each decade, along with their matching Julep shades (I went with all Julep for these because I love their nail polishes!). All the nail polishes colors shown above are available here on Julep’s online store.